Latest Update 11.10.2013 : Web Portal is Opened for Profile Correction (Name / DOB / Photo). Institutions are instructed to the corrections on or before 17-10-2013. This Portal Profile only will be updated in your University Mark Sheets and Degree Certificates. So, Students, If you have any changes on your profile please immediately inform to your college officials to take action to change in portal. If your data Not yet updated by your college then your marks and attendance report will be blank and can be updated by tomorrow. 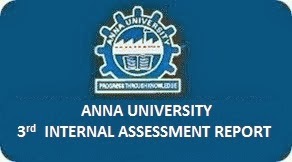 Anna University 3rd Internal Assessment Reporting Period for Higher Semester UG & PG is 10.10.2013 - 12.10.2013. This Report is inclusive of 3rd Attendance Report and 2nd Internal Assessment Marks (2nd Monthly / Cycle Test Marks) Reports. The both reports updation will be starts by 10.10.2013 and students can view thru their students login from 10.10.2013 Evening 6.00 PM. The Final / 4th Assessment date may be got changed because of the University Exam Timetable. So most of the colleges are already prepared for start the Model Exam on the reopening day after the Pooja Holidays.